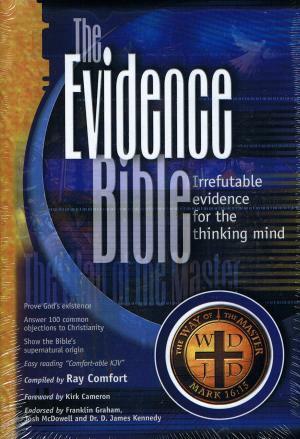 I have a copy of THE EVIDENCE BIBLE in front of me. I have spent much time studying it's pages, which are commented extensively by Ray Comfort. I can honestly say that THE EVIDENCE BIBLE contains MUCH good commentary, quotes and theologically correct teachings; HOWEVER, Ray Comfort has been caught up into the damnable heresy of Lordship Salvation. The Devil has crept into many churches today through the teaching of Lordship Salvation, i.e., the false doctrine that a person must try very hard to stop sinning in order to be saved. Biblical repentance is turning to Jesus Christ to be saved from one's sins; not turning from one's sins as a prerequisite to placing one's faith in Christ. There is a fine line between faith and foolishness. Ladies and gentleman, Ray Comfort is teaching works salvation! According to what we just read by Ray Comfort, every believer who willingly allows sin in their life won't be allowed into Heaven. Mr. Comfort is teaching that you cannot get to Heaven unless you try really hard to stop sinning. This is a works-based mindset and a false Gospel. The group in Matthew 7:21-23 were unsaved because they refused to do God's will concerning salvation. It wasn't because they still had personal sins in their life. Every believer still has sin in their life! We all sin every day. That's not to say that we have God's approval to sin, God forbid (Romans 3:31). It just means that even the best of Christians are still sinners. Ray Comfort wrestles the Scriptures to his own destruction (2nd Peter 3:16). If you think that forsaking sins was necessary for you to be saved, then you have religion, but you have never been born again! The reason why the religious people in Matthew 7:21-23 were not allowed into Heaven was because they had failed to do the will of God the Father; by believing on Jesus Christ, the Son of God (John 6:40). They died in their sins, in their own self-righteousness (Romans 10:3-4). They ran around saying “Lord, Lord” like the unsaved Lordship Salvationists, perverting the gift of God into a lie in their woeful ignorance. Ray Comfort presents a false interpretation of the Biblical Gospel message. The Bible teaches that salvation is without works of self-righteousness (Romans 4:5-6; Romans 10:3-4; Titus 3:5; Ephesians 2:8-9). The good news is that Jesus is the Christ, the Son of God, Who came into the world to SAVE SINNERS. Just shut up and get on the ark! All Christians willfully sin at times, because the flesh cannot be tamed (Romans 7:14-25). Only self-righteous hypocrites teach that a person can live above sin. Believers should try to live right with God's help (Romans 3:31); but they will falter at times because of the flesh (Proverb 24:16; Psalm 103:14). Satan is a Beautiful Liar—So are Lordship Salvationists! Every proponent of Lordship Salvation deceitfully claims that eternal life is a free gift, provided by God's free grace; yet, they 100% contradict themselves when they mandate a changed life as part of saving faith. This is how false prophets operate. The most effective lie is the half-truth, because in part it can be defended with incontestable logic. It was 33rd degree Freemason, Manly P. Hall, who said that. The most effective lies are built around truth. For example: Eve rationalized 3 truthful reasons why she should eat the forbidden fruit: 1) It looked good, 2) It was nourishing, 3) It would open her eyes to good and evil (Genesis 3:6). But those 3 truths were built around Satan's lie that Adam and Eve would become as gods and that God had lied to Eve (Genesis 3:5). Satan is such a liar that he even accuses God of being a liar. No wonder Jesus called the Devil the father of all liars in John 8:44. Rat poison is only 1% actual poison, the rest is wholesome food. Much of what the Jehovah's Witnesses, Mormons, Seventh-Day Adventists and Catholics teach are true; but it's the small percentage of their corrupted core beliefs that make them dangerous non-Christian cults. John MacArthur produces some excellent teachings; but any man who tramples under foot the literal, physical, blood of Jesus Christ is an unsaved Modernist. That is exactly what Hebrews 10:29 teaches! The most important doctrine of the Christian faith is the efficacy (redeeming power), necessity and importance of the physical blood of Jesus (1st Peter 1:18-19). The Lord was looking for literal blood applied to the doorposts when He passed through Egypt (Exodus 12:13). If some theologian like John MacArthur told his family not to apply the blood because the dead lamb was symbolic and sufficient by itself, then THE FIRST BORN DIED! That blood had to be APPLIED!!! Everything Pertaining to Salvation Was Completed in the Holy of Holies! Lordship Salvationists fail to comprehend the doctrine of the blood of Jesus and the work of the Old Testament high priest, which was a shadow of things to come in heavenly places (Hebrews 10:1). The Bible teaches from Genesis to Revelation that eternal life is a free gift, paid for by the Lamb of God, whose blood was sacrificed and applied to the heavenly mercy seat to take away our sins (Hebrews 9:12,22-24). This is what the work of the Old Testament high priest symbolized each year on the Day of Atonement (Hebrews 9:7-12). The Israelites weren't required to live separated and holy lives throughout the remainder of the year for their sins to be forgiven. No, everything was centered and rested upon that blood on the mercy seat in the holy of holies in the tabernacle! Everything!!! Our salvation is solely based upon the redemptive work of Jesus Christ, who applied His literal blood to the mercy seat in the heavenly tabernacle. Jesus hadn't even died yet when He stated, “It is finished.” He obviously hadn't been buried, nor risen yet. So Christ's work of redemption was NOT finished on the cross; just as the work of the Old Testament high priest was not finished when he killed the spotless lamb in the courtyard of the tabernacle. The work of the high priest wasn't done until the BLOOD WAS APPLIED to the mercy seat in the holy place upon the ark of the covenant. SOURCE: Hard to Believe, p. 93. What? The life we live determines our eternal destiny? Heresy!!! What happened to the blood of the Lamb applied to the mercy seat? Oh, that's right, MacArthur DOESN'T believe that the Lamb's blood was applied to the mercy seat in Heaven. I looked in The MacArthur Study Bible (a piece of trash by the way), and he literally teaches that Hebrews 9:12 doesn't actually mean what it says about Jesus entering BY HIS OWN BLOOD into the holy place. MacArthur claims that it is only symbolic of Christ's death. Do you understand why I harshly expose John MacArthur, Ray Comfort and Kirk Cameron (who promotes MacArthur's Study Bible on his website by the way). Forsaking one's sins is the FRUIT of genuine repentance; and not a part of the ROOT of saving faith. There are no prerequisites to being saved. Salvation happens when a person acknowledges their guilt of sin before God and believes on Jesus as the Christ, the Son of God, to forgive their sins. We are SINNERS and Jesus is the SAVIOR. It's that simple! Salvation is receiving, not giving. Eternal life is the gift of God (Romans 6:23). Amen and amen! Ray Comfort is a disciple of John MacArthur, who is Mr. Lordship Salvation himself. MacArthur has been a featured guest on Way Of The Master radio. Kirk Cameron is also a disciple of MacArthur and teaches Lordship Salvation. They're all buddies. MacArthur has corrupted millions of people with his perverted theology, denying the literal blood sacrifice of Jesus, requiring works for salvation and teaching predestination to salvation (which is utter heresy). Please read, Not Chosen to Salvation. I am dismayed when I hear professed Christians say that the Bible is not something we should fight over. What? If God is going to judge us for the very words we speak (Matthew 12:36), then don't you think that the Words He speaks are equally important? Yes, of course! Everything that we believe as Christians hinge upon EVERY WORD THAT PROCEEDETH OUT OF THE MOUTH OF GOD (Matthew 4:4). Therefore, I need an every word Bible. God only wrote one Book. There are literally hundreds of English translations, which vary widely in their content, meaning and doctrine. This is why I defend, love and promote only the beloved, preserved and INSPIRED King James Bible. All other English translations on the market today are corrupt! It does matter, very much, that we have the right message, from a trustworthy Bible. Only the trustworthy King James Bible uplifts the precious name of Jesus, the Godhead and the deity of Jesus. Nearly every modern perversion of the Bible completely removed the all-important word, GODHEAD (Acts 17:29; Romans 1:20 and Colossians 2:9). This is one of a thousands reasons why I love, defend, promote and only use the King James Bible (which DOES contain the word Godhead). Since the term “Trinity” is not found in the Scriptures, the word “Godhead” is very important; which teaches the same doctrine. Ray Comfort once kindly wrote to me, attempting to convince me that our doctrinal differences are a mere matter of semantics (i.e., wording the same belief differently). I told him that we do not agree at all on the issue of salvation, because he believes that a person cannot be saved and deliberately continue in sin; but I do believe that. The difference is much more than mere semantics, it is night and day. I believe that one's salvation is solely based in Christ's righteousness and has absolutely nothing to do with one's desire to depart from sin. Romans 4:5-6 plainly teaches that salvation is without works of self-righteousness, and that we are saved by the imputed righteousness of Jesus Christ. Salvation is of the Lord. A changed life is the FRUIT of genuine repentance; and not a part of the ROOT of saving faith. A person gives up their sins because they ARE a Christian; and not to BECOME a Christian. The changed life comes AFTER a person is saved, as a person grows in the milk of the Word (1st Peter 2:2). Ray Comfort on the other hand, believes that a person must stop deliberately committing sin to be saved. Mr. Comfort teaches that those who profess faith in Christ, but still continue in sin, are not saved because they have never given up their sins, which he teaches is necessary for salvation. Ray Comfort teaches that a changed life is part of the ROOT of saving faith. According to Mr. Comfort, a person must give up their sins to BECOME a Christian. In this false plan of salvation, a sinner must change in order to be saved. Do you see the drastic difference between the two different Gospels? The latter is damnable heresy. Ray Comfort is doctrinally messed up from following John MacArthur. Jesus said in John 6:37 that He would not turn away anyone who comes to Him for salvation, and that includes the vilest sinner who isn't ready to give up his sins yet. All God requires is that a person acknowledge their guilt of sin (Romans 3:19), believing on the Lord Jesus Christ to be forgiven (Acts 10:43; Romans 10:13). Acts 16:30-31, “Sirs, what must I do to be saved? And they said, Believe on the Lord Jesus Christ, and thou shalt be saved, and thy house.” That's the way to be saved, i.e., to believe on Jesus as the Christ. There are hundreds of perversions of the Gospel nowadays. Every believer needs to be a watchman, a pit bull guard dog, that shines the Light of God's Word upon the darkness. In the absence of Light, darkness prevails. The need has never been greater for the LAMP of God's Word to be shone in the world today (Psalm 119:105). That's the only way to expose the darkness, i.e., by shining the Lamp of God's Word upon it. Salvation is simple—we are SINNERS and Jesus is the SAVIOR. If a person must stop sinful habits to be saved, then salvation is extremely complicated. Jesus clearly taught that the reason why the group in Matthew 7:21-23 wasn't saved is because they had failed to do GOD'S WILL. John 6:40 tells us that God's will is for us to BELIEVE ON JESUS CHRIST. Ray Comfort would have us to believe that amending one's ways and ceasing from committing sins is God's will for salvation; but that is NOT what the Bible says at all. That is John Macarthurism! The Bible teaches that our salvation was taken care of by our heavenly High Priest, Jesus Christ (Hebrews 4:15-16); Who BY HIS OWN BLOOD (Hebrews 9:12) entered into the holy place in the presence of God the Father on our behalf (Hebrews 9:24). If you understand this truth, and the work of the Old Testament high priest and what it represented, then Lordship Salvation crumbles into a million pieces of rubbish!!! Ray Comfort's Perverted Gospel | The Unbiblical REPENTANCE Heresy!